The research, published in Nature this week, was led by the STAR Institute at the University of Liège, and used the orbiting NASA Spitzer Space Telescope in addition to ground-based facilities including the Liverpool Telescope (LT), owned and operated by Liverpool John Moores University's Astrophysics Research Institute (ARI). 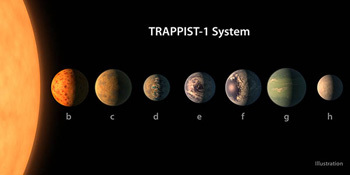 The LT helped to detect the planets as they passed in front of their parent star, the ultracool dwarf star known as TRAPPIST-1. At least three of the planets could harbour oceans of water on their surfaces, increasing the possibility that the star system may play host to life. This system has both the largest number of Earth-sized planets yet found, making it a key object for future study. “LJMU is at the forefront of the search for other-Earths and the search for other life in the Universe. The Astrophysics Research Institute was delighted to be part of this ground-breaking research using the Liverpool Telescope. The discovery of multiple rocky planets with surface temperatures which allow for liquid water make this amazing system an exciting future target in the search for life." The ARI is currently in the process of designing the New Robotic Telescope, a facility which will take the Liverpool Telescope’s crown as the world’s largest robotic telescope dedicated to science, and which will be a powerful tool in the search for other Earths, liquid water and life over the coming decades. The Liverpool Telescope in action. Note: these are general observations taken by the LT and not footage of the research announced in this release. Credits: ©2016 Daniel López / IAC. The Liverpool Telescope is one of the largest and most advanced fully robotic telescopes in the world, especially dedicated to the study of variable and transient astronomical phenomena. The timelapse video above shows this giant robot observing the universe at the Instituto de Astrofísica de Canarias (IAC) Roque de los Muchachos Observatory on the summit of La Palma (Canary Islands, Spain), one of the best places on Earth for astronomical observations. The Liverpool Telescope is mainly used for professional astronomical research, although part of its observational time is devoted to educational projects. In Spain, these are run by the Educational Project with Robotic Telescopes (PETeR) of the IAC, while in the UK, they're run by the National Schools’ Observatory (NSO) at LJMU. The timelapse above is a production of the IAC Communication and Scientific Culture Unit and Daniel López (www.elcielodecanarias.com), with the collaboration of the LJMU Astrophysics Research Institute. This article was adapted from the LJMU press release.